Fear and Trembling continues to fascinate and frustrate all who find, for many reasons, that they must struggle with it. Not only “professional intellectuals,” but students and other seekers perennially wrestle with it, working their way through its difficult dialectic. Both philosophers and theologians are provoked by the prominence of typically Kierkegaardian terms, categories, and arguments—“paradox,” “resignation,” “faith,” “the absurd,” “the individual,” “the poet,” “immediacy,” “the ethical,” “leap,” “offence,” “silence,” and others. Such key concepts are present in varying degrees in Fear and trembling and are taken up into later works (The Concept of Anxiety, Philosophical Fragments, Concluding Unscientific Postscript); some have a prehistory in Either/Or and even in Kierkegaard’s dissertation. These ideas are central not only to this work, then, but to the whole of the authorship. Philosophers and theologians cannot ignore these concepts, for they are central in very different ways to their various disciplines. Indeed, in Fear and Trembling Kierkegaard challenges many of our modern assumptions, and he will continue to frustrate and fascinate us for so long as we attempt to sort out ourselves and our times. 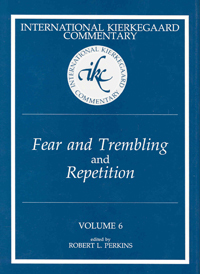 The challenge of Fear and Trembling has been joined in IKC 6. Te resulting commentary is for the rest of us a running start on one of SK’s most fascinating and most important works. IKC 6 includes the first collection of essays to concentrate the talents of a number of scholars on Kierkegaard’s obscure little book Repetition. For all its difficulty, Repetition indeed seems to be catching on, and for good reason. Repetition is, in a word, about hope. It is about persons caught up in their mistakes, sins, and farces. In Repetition, Kierkegaard suggests hat in the midst of our epistemological errors, the weakness and/or arrogance of our wills, and in making fools of ourselves or being made fools of, there is yet hope for us. Everlasting hope. The game is not over till it is over. Perhaps even death is only the final farce, and hope is still the last word—though Kierkegaard does not take us quite so far. Repetition indeed goes to the heart of the matter, to the core of human existence. Likewise, the commentators represented here lead us to the heart and core of the fundamental and existential concept of Repetition.